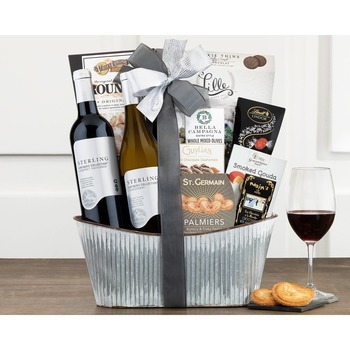 Make it a truly special occasion with this beautifully presented wine, cheese and chocolate gift basket featuring two handcrafted wines from Sterling Vintner's Collection: chardonnay and meritage - a smooth red blend. 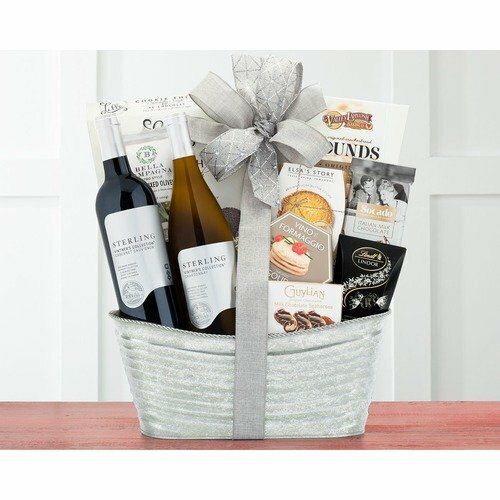 A wine stopper and assortment of brown sugar butter cookies, sesame crackers, garlic herb cheese wedges, Godiva truffles and other snacks complete this gift. * Living in Norway it is very important that we can trust that the flowers etc. are of the best quality. We know that we can depend on good service from them.